On July 18, 1635 (according to the old Julian calendar), English natural philosopher, architect and polymath Robert Hooke was born. He is known for his discovery of the laws of elasticity, now known as Hooke’s law. Hooke did research in a remarkable variety of fields. He was one of the first men to build a Gregorian reflecting telescope and to suggest that Jupiter rotates on its access. His studies of microscopic fossils are what led him to be one of the first proponents of a theory of evolution. The curious and talented young Richard Hooke visited a miniature painter once and glanced with his own capabilities. He moved to London at the age of 13 and received a good schooling education while extending his abilities in technical drawing and crafting. As the years went by, Hooke got to know many contemporary influential figures in science and technology, which supported his ideas and actual achievements. For instance, he designed his own flying apparatus. Hooke began working for Robert Boyle and together they had a very productive scientific partnership. 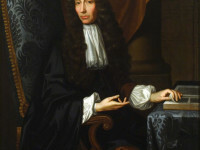 In 1660, the famous Royal Society was founded and Hooke was one of the first young scientists to grow and impressive reputation internationally while working at the institution. He became a member of the Society three years later and started teaching at the Gresham College even though he never received a scientific degree previously. While being occupied with the position as the Royal Society’s curator, he had to prepare weekly experiments and lectures. In 1663, he was given the task to demonstrate one of his observations with his self built microscope at every weekly meeting. He began drawing very precise and impressive images of very small insects and objects found in nature. After about one year of weekly presentations, the Royal Society supported Hooke’s publication titled Micrographia as a collection of all drawn observations. Next to his observations, Hooke presented several theories for instance on the origin and structure of matter, which the Royal Society quickly distanced from. This was presumably Hooke’s most impressive and most successful publication. 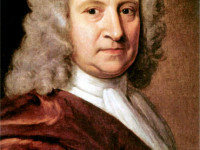 However, Robert Hooke was not only known for observing nature’s smallest objects, he was also a well known astronomer who liked to build and improve observing and measuring instruments. In the 1660’s he was given the task to measure the taurus constellation along with Christopher Wren and as a result, a very detailed drawing of the Pleiades, which he published later on. He often speculated about the movements and structures of planets and their satellites. Hooke performed several experiments on how the moon surface was formed and tried to draw parallels to the history of Earth. Hooke began observing the movements on the surface of the Sun, which he developed a whole new telescope for. Unfortunately, Hooke’s achievements were overshadowed by the accusation of non precise methods in astronomy and his capabilities as astronomer were questioned. In the 20th century the interest in Hooke and his works grew again. 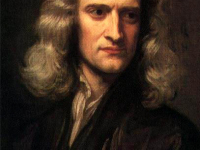 He was honored with craters and asteroids named after him and several scientific institutes now carry his name. At yovisto, you may enjoy a short demonstration by Dr. William Poole on Robert Hooke’s Micrographia.